Check out the new, smaller FV-30 instead!!! Analog Man carries the Boss FV-500H/L. Roland / Boss has finally come out with a really heavy duty pedal, for people who don't like the plastic pedals normally available. This pedal is really cool because it works as a normal volume pedal OR an expression pedal! Roland / Boss has finally come out with a really heavy duty pedal, for people who don't like the plastic pedals normally available. This pedal is really cool because it works as a normal volume pedal OR an expression pedal, by plugging into different jacks. For expression use, you don't have to use a Y or Insert cable like with most volume pedals, just a normal cable with stereo ends. They also have an adjustment screw on the bottom for more or less force to move it. 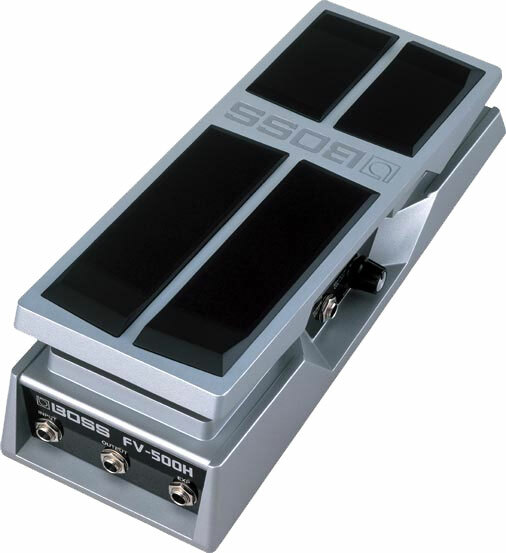 The 500H is high impedance for mono guitar or expression pedal control using a high resistance pot. The 500L is stereo and works with low impedance signals for keyboards or active electronics or expression control with a low resistance pot. We offer a BUFFER option, but it's a stereo volume pedal so we will put the buffer one the #1 jacks, #2 will be normal (unbuffered/passive). We can add two buffers if needed for $45 more. The buffer option should be ordered on the LOW impedance version. Adding a buffer will not allow it to work as an expression pedal.